Breathtaking countryside, superb roads, vineyards and beautiful coastline on this round-trip. All the highlights of Tasmania combined with some spectacular biking roads. An amazing once in a lifetime journey through the heart of Australia. 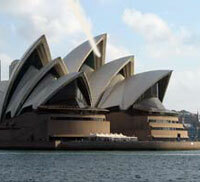 Sydney is the capital city of New South Wales and the site of Australia's first permanent European settlement. It is one of the world's most beautiful cities. Set on a large harbour it has the natural advantages of walks around the harbour foreshores, spectacular views, bayside parks and gardens and the architectural magic of the Harbour Bridge and the Opera House. There's everything from 4 day return trips to 24 day one way journeys. Tours can be tailored specifically to you (number of days, accommodation before and after etc.) and so just ask us to adjust things to suit you. Everything is tailorable to your specific requirements, from type of accommodation to length of tour. When you've found something you like the look of, just get in touch. For more information select a tour from the menu on the right.